Help us put 1,500 new books into the hands of special education students next month. Gifts of $100 or more will be matched! Students ask Arielle questions about high school. at the Chess for Success State Tournament and the 2013 Girls Play Chess Tournament. Jacqueline, a 7th grader, was part of a middle school team that qualified for the state tournament, and helped the team to a 3rd place finish! Jessica, also a 7th grader, took home a 2nd place trophy for her performance at the Girls Play Chess tournament. Both young ladies have been participating in their school’s afterschool chess club for a number of years. The game of chess requires dedication, patience and perseverance, something both of these stellar students have exemplified in both school and in their chess careers. Our sincere congratulations to both of them! Students in The Shadow Project earn books for making progress toward their academic and social goals. For many of the 1,300 students in program who come from low-income homes, owning high-interest books such as Diary of a Wimpy Kid or the fact-filled Scholastic Book of World Records is out of reach. In fact, books earned through The Shadow Project are oftentimes the only books these children have at home. Thanks to Traci Smith of Scholastic Book Fairs, The Shadow Project is able to fulfill student and teacher requests for popular titles. 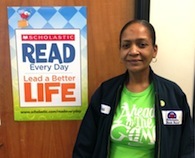 Traci knows what a difference reading makes for students in special education and helps us collect exciting and culturally relevant books that our students love! Traci has been helping The Shadow Project engage eager readers for six years. We are so grateful for her support! Help us reach our goal of buying 1,500 new books for our special education students next month. Donate $100 or more now and your gift will be matched! That means your $100 gift buys more than 50 books; $500 puts nearly 300 books into the hands of newly-enthusiastic readers. You’ll be providing culturally relevant books to our students, that is, books that positively depict characters with dyslexia, ADHD, autism or speech impairments. Want to help select books? Join us in June for one of two planned trips to Scholastic Warehouse in N.E. Portland. For more information, please email our Assistant Director Lena Teplitsky at lena@shadow-project.org. Shadow Project volunteer Arielle Schnitzer recently visited Harrison Park students in The Shadow Project to talk to them about her experience as a teenager with learning disabilities. The students were eager to hear about high school and receive tips about how to deal with learning disabilities at school. “Our students could certainly relate to the challenges that Arielle has faced and felt hopeful that they too could navigate the school years ahead!” said teacher Beth Brod. We’re looking for more adults and teens with learning disabilities who can visit a Shadow classroom and share their stories. To get involved, please email lena@shadow-project.org. We are deeply grateful to The Robert D. and Marcia H. Randall Charitable Trust, which awarded The Shadow Project a $7,500 grant to improve educational outcomes for students with disabilities and strengthen school district partnerships by incorporating recommendations by the Harvard Business School Association of Oregon. A long-time supporter of our program, The Randall Trust assists organizations that provide opportunity to the underprivileged; promoting personal responsibility and initiative through values-based programs focused on improving education and social well-being with challenging, stimulating instruction.